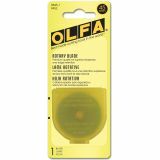 Rotary Blade Refill - OLFA Rotary Blade Refill. These 45mm replacement blades are for Olfa's 45mm Standard, Deluxe or Quick Change Rotary Cutter (not included). One blade comes in a plastic container that you can use later for storage. Made from high quality tungsten steel for durability and superior edge retention. Imported.